Don’t you love it when you wake up after having had the most amazing dream ever? You just know it has to be a good day. Today was a bit of a doozy but it all turned out well. I started with an intense work out (oh goodness I was a sweaty mess). 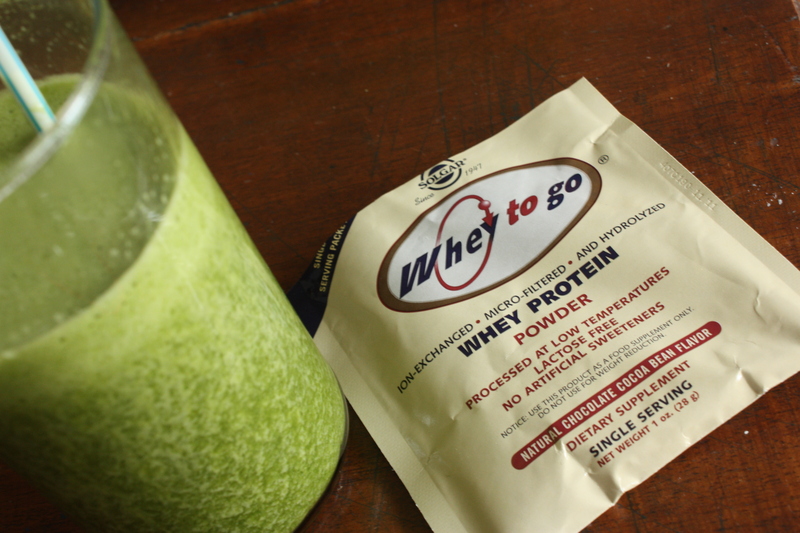 Then had a green monster for breakfast featuring the only protein powder I’ve tried so far that I’ve liked. So you’re probably wondering about the title, right? You guessed it. 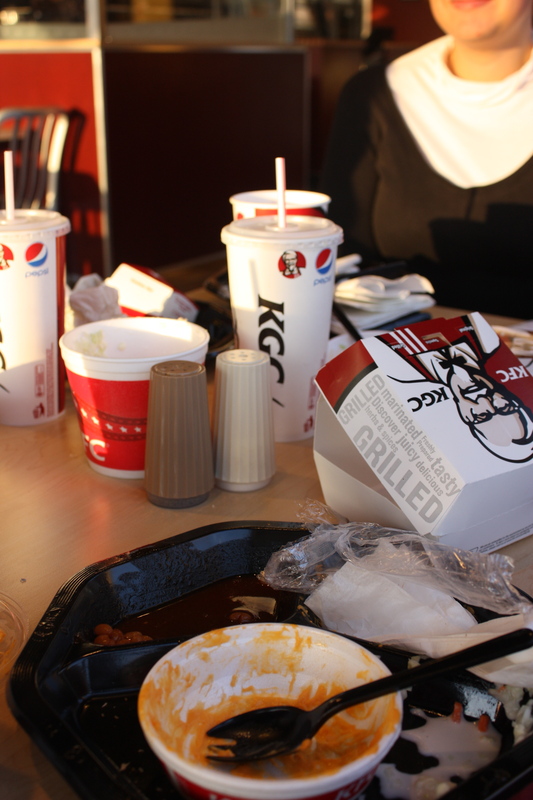 Some friends and I drove to Cortland to KFC (because Ithaca doesn’t have one) so they could try the double down. I had some biscuits and sides. You’re probably not going to believe this but the franchise we went to stopped selling the grilled version because they weren’t selling enough! Isn’t that nuts?! Ugh NEED to do stuff tonight! Have a good one! 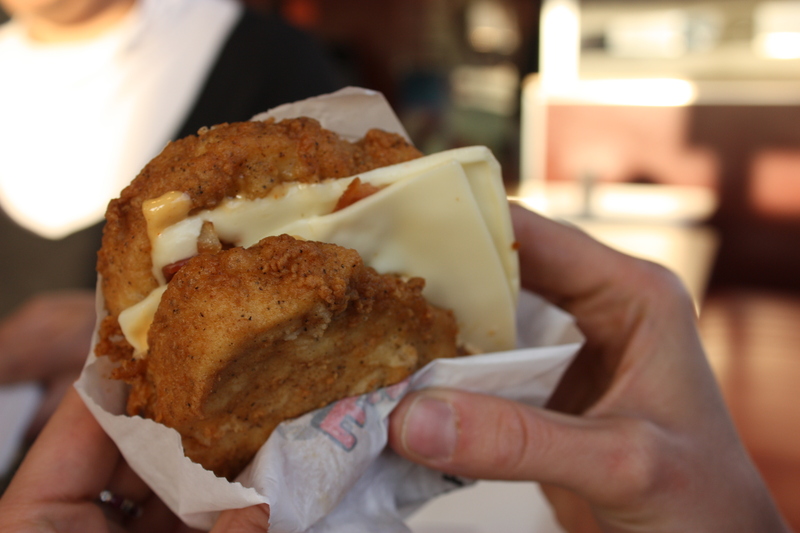 Have you tried the Double Down? Been curious to do so? Do you think it’ll last? This reminds me of that funny NPR article you posted when they tried this heart-attack of a sandwich. Or chickenwich. I totally think it will last though! It’s so funny looking but this better not be the end of bread. Hell to the no. Dustin wants to try the Double Down (he LOVES KFC, or used to anyway; says it’s so salty now but I think he’s used to my bland cooking lol). I’ll admit, anything with cheese in the middle does look pretty tasty!! Although, I’d be happy with just a grilled cheese sandwich lol. 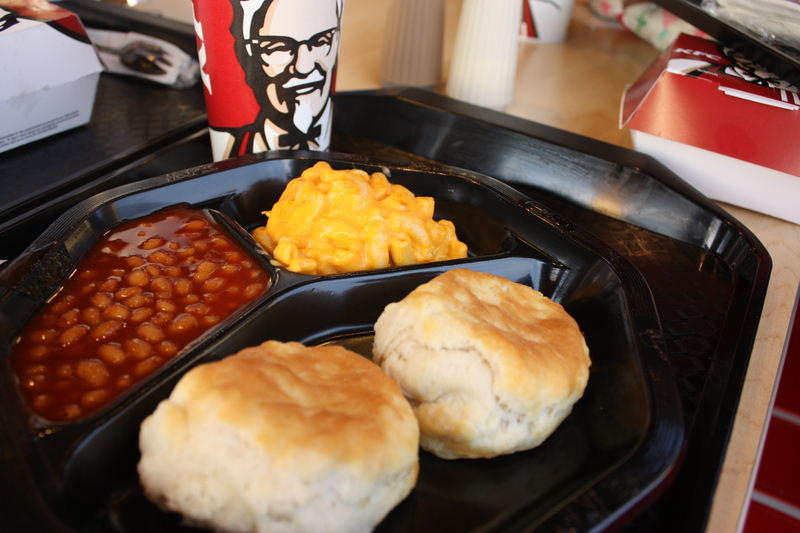 I’d also be happy with the biscuits and sides like you got. I’m totally a side dish queen. i saw a vegan version my husband wants to make. but otherwise, i’m not curious at all! Ha. I saw the double-down on SNL and thought it was a joke! Yeah, as a vegetarian, can’t say I’ll be trying it 🙂 I’d definitely tag along with people who wanted to though! Ha! Exactly! I just had to SEE it in person! Hope you had a good night – and have a great day today! Yeah! I was surprised the nutrition stats weren’t worse also! 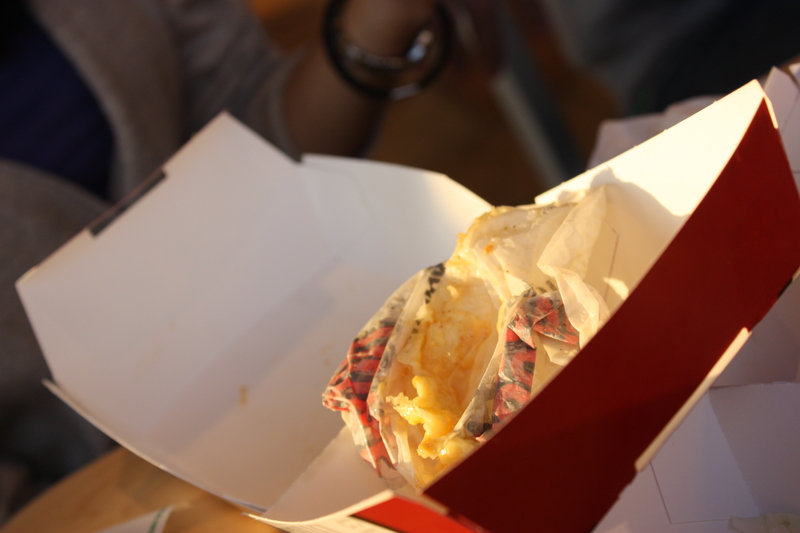 I came across this: http://consumerist.com/2010/04/10-fast-food-items-worse-for-you-than-the-kfc-double-down.html Sort of interesting! Oh I SO hope that this is still around in June when I visit the US! It just looks so awful that I NEED to try it. I’m sure it’ll be an experience but hey, I love Spam, and it can’t possibly be worse than Spam (which I don’t eat because I’d never fit in my jeans). And actually, we looked it up and it said it was like 540 calories…for the fried version?!? Which didn’t seem too bad to me. Interesting. Ugh.. that sounds kind of.. disgusting. Though I’m a veggie and hey, we’re weird people anyway ;). 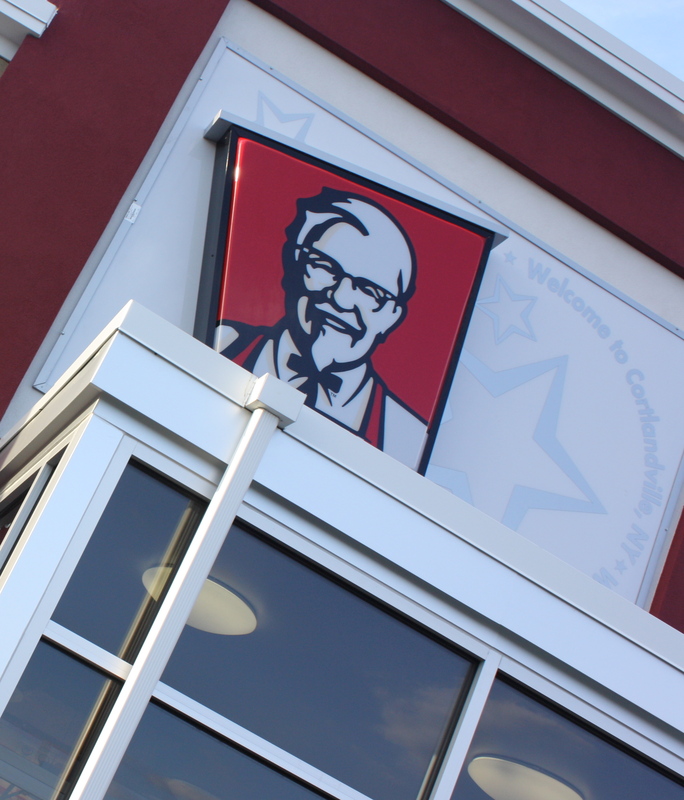 I honestly think that (probably) no company is worse than KFC and I’m so glad that we don’t have it over here. I LOVE YOUR BLOG!!!! im new to ur site.. just stumble across it. ur pics are awesome! such deliciousness. happy earth day! I don’t think I will be! I try to eat veggie when I eat out :)! I am all about the mashed potatoes!